But, what’s in it for me? It’s a fair question. And realistically, “WIIFM?” is what any of us would want to know when we’re shown something that is going to affect us. 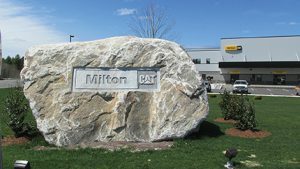 So, when Milton CAT, the Northeast and upstate New York Caterpillar dealership, made the decision to consolidate their Warner and Hopkinton, New Hampshire facilities and build a new location in Londonderry, that question was top of mind for their customers – and for their staff and vendors as well. The concept sounds great, but implementing it so it would result in a seamless operation was a serious undertaking. Just looking at the very diverse markets Milton CAT serves gives you an inkling of how complex the task was. According to Farrin, Milton CAT customers range from light and heavy construction, forestry, agricultural, governmental, paving, scrap, demolition and waste to marine, industrial, standby and prime power generation. Each has its own type of equipment and parts and special tools requirements; its own seasonal needs, uptime demands and emergencies; some customers are one or two-person companies, others, multi-state public firms, and everything else in between. 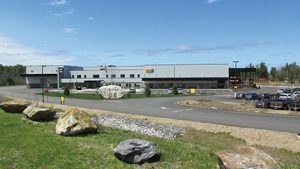 As large as the Londonderry facility is, the entrance itself and the lobby are spacious but not grand or imposing; a visitor doesn’t feel dwarfed. The greeter stands behind a counter, from where she can personally welcome each person who comes in. Behind her, a dedicated salesperson in an open office is attentive and available to give information and answer questions. To the left, several interactive electronic kiosks show a variety of applications and equipment; to the right, merchandise is attractively displayed. The parts counter is there, also, staffed by well-trained specialists with computers that pivot for easy access. Milton CAT-interior" width="300" height="169" />A customer who’s in a rush can get in and out in minutes, whether they are there to pick up a part, get information or make an appointment for service. Somebody who has the time, wants to talk or to familiarize themselves with the new facility can wander around the lobby, checking out the stands and displays, or sit with the salesperson for a one-on-one conversation. Farrin stressed that as important as giving their customers an outstanding experience, was making sure their staff had an exceptional learning and working environment. Let’s start with training, because it’s clearly an important function at Milton CAT. A climate-controlled, 40-person dedicated room with complete AV package is a great setting for Milton CAT’s full-time trainers to conduct lessons and workshops. Employee well-being has been taken into account in many other ways, too; the lunchroom seats 50 people, and is equipped with large refrigerators, microwaves, coffee makers and vending machines, and there are spacious and well-appointed women’s and men’s locker rooms. Service is at the core of the Milton CAT difference, and it makes sense that the service technicians’ working environment has been designed for optimum safety and comfort. All service areas are lit with high-intensity LED lamps; they have heated floors and are auto-ventilated; in the service area dedicated to the smaller equipment, hydraulic lifts elevate the machine to the height that’s most comfortable for the technician working on it so there’s no need to crouch or bend. Techs don’t need to leave their bay to look for tools or to get oil; everything they need is at their reach. 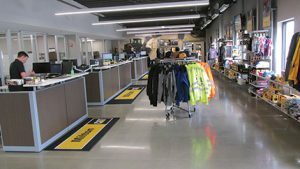 If a particular job will require special tooling that they don’t have in their own box, a quick visit to the computer in the tool room will let them know exactly which tools Caterpillar recommends to use, and the tool room attendant will locate them from their complete inventory. As you leave the building, you may notice the plaque on a big rock in front of the main entrance – it tells visitors that the beautiful sugar maple tree next to it was planted in memory of Jack Milton, who founded the CAT dealership in 1960 in a dirt-floor garage in New Hampshire, not too far away from the Londonderry location. • Location opened for business February 2016. • 100,00 s/f under roof. • Houses approximately 100 employees. • Eco-friendly pressure system washes all machines before they enter the shop. • High-intensity LED lighting, auto ventilation and heated floors in all service areas. • Dedicated, separate service shops for compact and larger equipment. • Crane coverage throughout service shops. • Automatic bulk oil delivery next to service bays. • Heating system burns recovered oil. • Undercarriage repair bay features two track presses, accepting up to 60-foot long track. 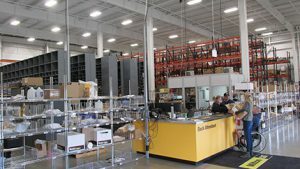 • Clean-room environment for the component repair and rebuild shop. • Hydraulic cylinder repair stand. • Parts warehouse management system boasts 99.7% accuracy. • Parts pickup dock has space for 20 F150-size pickups. Alicia Frick Laguarda is president of Inside Out Communications, Inc., Holliston, Mass.